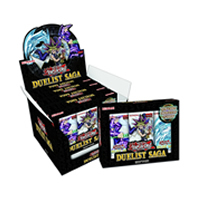 Collect memorable cards from the entire history of the Yu-Gi-Oh franchise with Duelist Saga! This special set features new cards from all five incarnations of Yu-Gi-Oh!, Mixed from both the manga and animated series, as well as cards inspired by some of the coolest monsters and concepts from each series. Includes 40 brand new cards and 60 reprints from every Yu-Gi-Oh! Series - Duel Monsters, GX, 5D's, ZEXAL, and ARC-V. Featuring cards from duelists such as Mai Valentine, Yami Bakura, Yusei Fudo, Don Thousand and Yuya Sakaki. • Set contains 100 cards - all ultra rare. • Cards used by some of the most loved characters. • 40 brand new cards and 60 re-prints. • Cards from mutiple Yu-Gi-Oh series. • 3 x Booster packs.